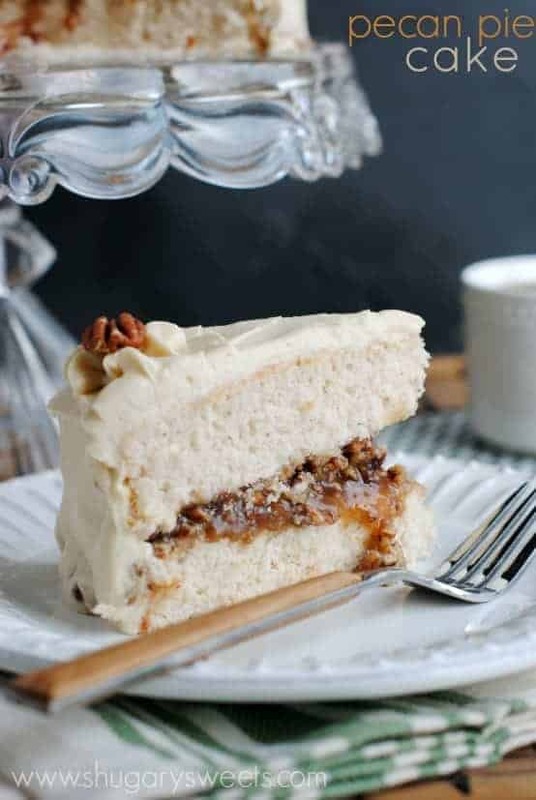 Delicious layers of homemade Spice Cake with a Pecan Pie filling. 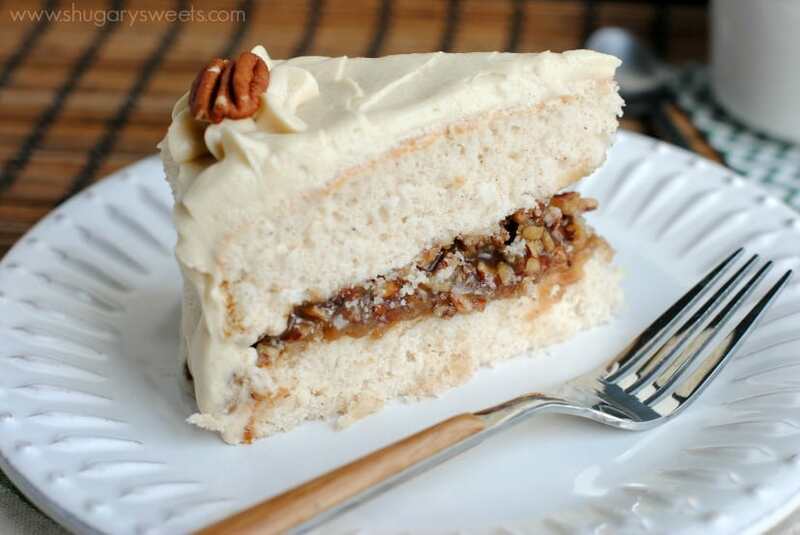 This Pecan Pie cake is topped with a creamy Brown Sugar frosting! Drooling yet? Guys, if you’re still planning what to make for dessert this Thanksgiving, your search is over. 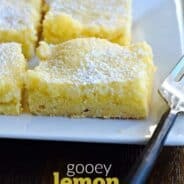 Normally when I bake for my family I share the recipes here on Shugary Sweets. IF they are top notch. Often times we eat things that are good, or okay, but not quite perfect enough for the blog. This time of year I find myself in overload of incredible recipes (and ideas)! And when I go on some crazy hair baking spree….my kitchen is left (a mess), but more importantly, full of treats. More treats than even my family can eat! Thank goodness for facebook. There are plenty of people who live near me who are willing to take some of these said treats off my hands. God bless them. Today’s awesome cake happened to be one of those desserts that came about in my kitchen when it was full. Full, as in, too many treats already filled my fridge and counters! Here’s the thing, when I bake something, or come up with an idea, I have no guarantee that it’s going to succeed. So I don’t always expect to have a huge cake on my counter, because many times they have ended in the trash (oh, the joys of recipe development)! You may remember last year I teamed up with Fisher Nuts and KARO corn syrup and made you these delicious Pecan Pie Truffles. I tell you, they were awesome, and I’ll be making them again this year for Thanksgiving! Strawberry Chocolate Tartlets: these are so fun, with ready made mini graham crusts! Oatmeal Butterscotch Cookies: I love the crunch of pecans in this chewy, classic cookie recipe! Sweet and Crunchy Snack Mix: stop buying those little bags when you can make this in bulk at home, and it tastes so much better too! Spiced Cranberry Tart: loving the pumpkin pie spice with fresh cranberries, this one is going on my holiday dessert menu for sure! Walnut Shrimp Poppers: for the savory lovers, this one is a must make! I started with my from scratch, spice cake recipe. If you want to save yourself a step and use a boxed mix, go for it. I enjoy making homemade cakes from scratch, but I’ve used plenty of mixes too. Your call, I’ll never know! For the filling, you’re going to heat the brown sugar, KARO dark corn syrup, heavy cream, butter and kosher salt until it begins to boil. Stirring constantly, you want to boil this for a full minute. And when I say “boil”: I’m talking about a full rolling boil, not the small bubbling you get in the beginning! Once it’s boiled for the full minute, add in the vanilla extract and chopped pecans. You’ll want to chill this until it thickens. You can do this step before baking your cakes. Or make the filling the night before. to get a nice level cake. If you don’t have them yet (and you really should!!) just use a serrated knife to cut the dome off the top of your cake. This is especially important for the bottom layer. You don’t want the pecan pie filling oozing out the sides too much. Finally, the brown sugar frosting. In making this type of frosting in the past, I have melted the brown sugar with the butter, then let it cool before whipping it with the cream cheese and powdered sugar. But this time, I went the easy route. I just beat the cream cheese, butter, brown sugar and powdered sugar together. And it turned out glorious! The first version is a little more “caramel-ly”, while this one definitely has more of a brown sugar taste. Which is great on today’s cake! So, there you have it friends, the perfect holiday cake! Print this one out for your recipe box, it’s going to be a new family favorite! Delicious layers of homemade Spice Cake with a Pecan Pie filling. 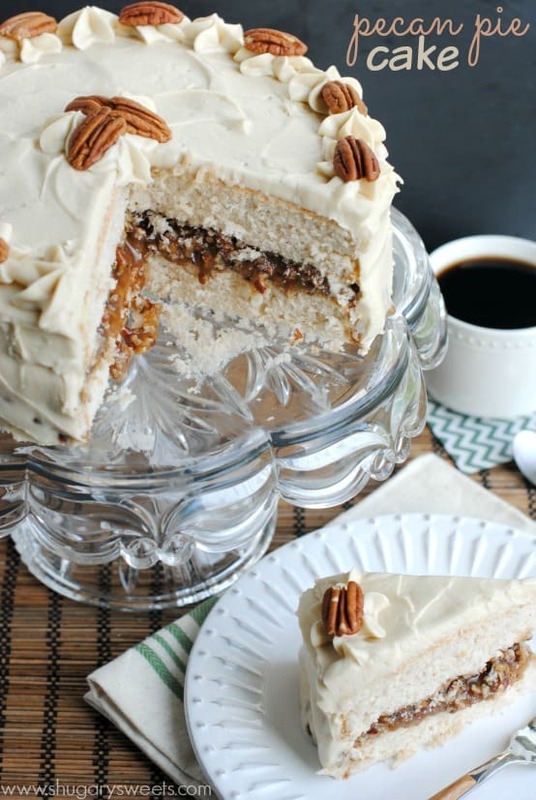 This Pecan Pie cake is topped with a creamy Brown Sugar frosting! Begin by making the filling first. You can do this night before, or before preparing the cake. In a small saucepan, combine the brown sugar, KARO dark corn syrup, heavy cream, butter and salt. Heat over medium heat until mixture begins to boil, stirring constantly. Once boiling, continue to stir and boil for one full minute. Remove from heat and add in the vanilla extract and chopped pecans. Chill in the refrigerator until it thickens, at least two hours (or overnight). For the cake, preheat oven to 350 degree F. Prepare 2- 9inch cake pans by spraying with non stick baking spray. Set aside. In a small bowl, combine egg whites with 1/4 cup of the milk. Mix and set aside. 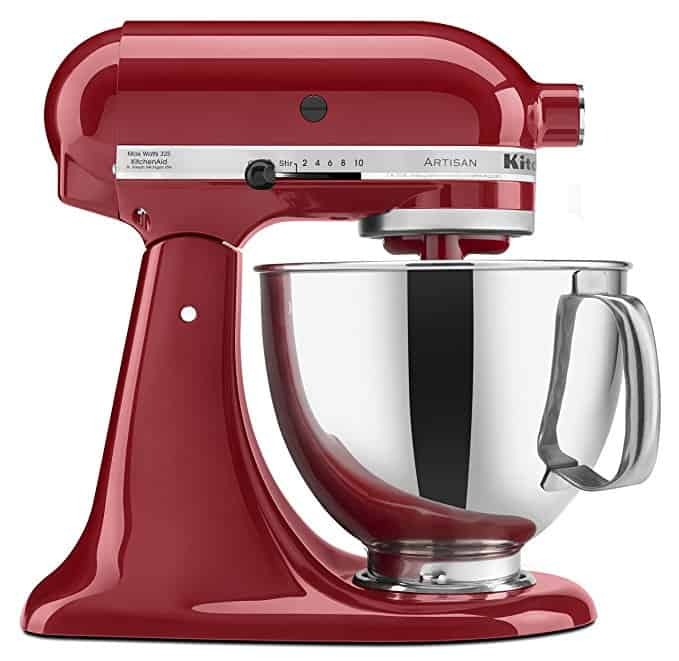 In a large mixing bowl, beat butter and sugar until creamy (about 2-3 minutes). Add in the dry ingredients and mix until combined, scraping down the sides of the bowl as needed. Beat in the egg white mixture and slowly add the remaining 1/2 cup milk. Beat for a full 3 minutes. Pour batter into prepared cake pans. Bake for 25-30 minutes. Remove and cool for 5 minutes in the pan. Then invert on wire racks and cool completely. For the frosting, beat cream cheese, butter, brown sugar and powdered sugar for 5 minutes, scraping down the sides of the bowl as needed. 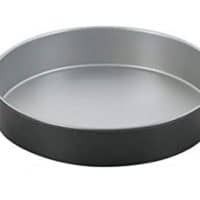 To assemble cake, lay one layer of cooled cake on a cake plate. Make sure the dome of the cake has been sliced off, so that the cake is level. Top with the chilled and thickened pecan pie filling. Then top with the second cake layer. Spread a thin layer of the frosting on sides and top of cake to make a crumb coating. Chill for 15 minutes in the refrigerator. Spread the remaining frosting over the cake and garnish with pecans. Keep cake chilled until ready to serve. Then let rest at room temperature for 15 minutes. ENJOY! Be sure to follow my “Let’s Give Thanks” Pinterest board for more Thanksgiving ideas! Today’s recipe was originally published on November 16, 2014 and has been republished in November 2018. Oh wow 🙂 I was sure I had my desserts planned for Thanksgiving, but now I come across this. I will have to change things up now! Gorgeous! Cake is always better…I mean, it’s got frosting! Frosting trumps pie. Wow! What a super impressive cake! A showstopper indeed. Aimee this is gorgeous!!!! WOW!! I saw it on Pinterest a few hours ago and already pinned it but coming by to comment b/c it’s too pretty not to tell you! 🙂 The layers, the flavors. Oh my. Your scratch cake, then that filling! and then….the brown sugar frosting. Whoa. I could each thing by itself and definitely the frosting by the spoonful! I’ll take cake over pie anyday. The filling and frosting look SO good on this one. Pinned! It’s a pie in a cake! A pake! And it’s beautiful. I love the fact that you put straight brown sugar into the frosting. That’s pretty genius. And that oozing filling. I like your crazy hair baking mode! Yeah, I’m not really complaining 🙂 A pake, LOL, haha!!!!!! Oh mah goodness, I just died! I am in love with everything about this cake!! How fun would it be if we were neighbors?? I wish I was your neighbor! 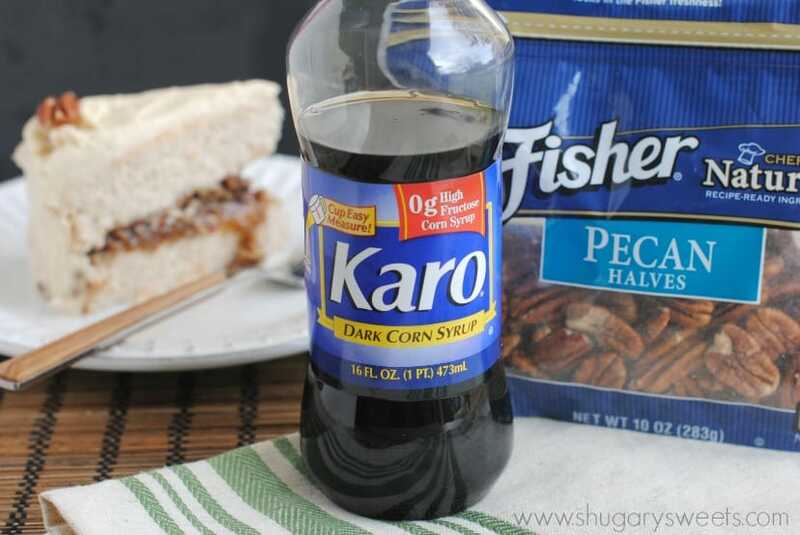 What a fun twist to pecan pie! That gooey center is killing me!! I would love to just dive headfirst into that cake for sure!!! It is absolutely gorgeous! What a beautiful looking cake! I have a fridge full of Fisher nuts…they are the best! Okay, you created an AMAZING cake flavor here! 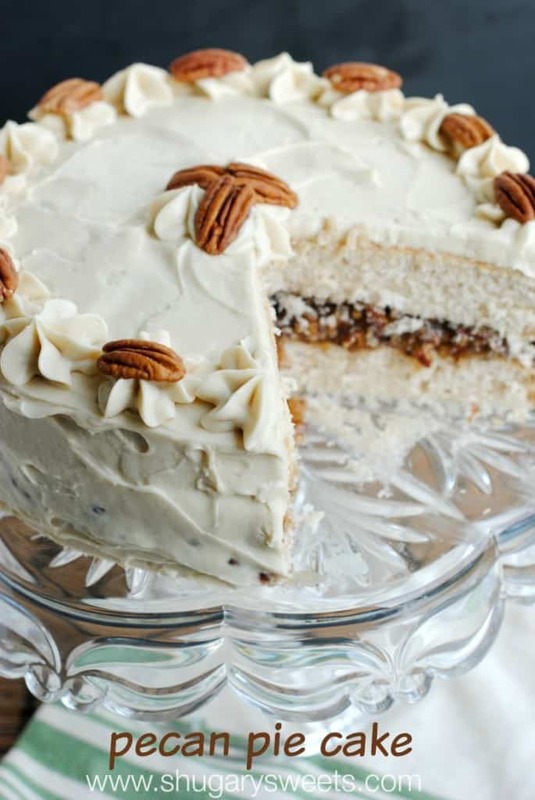 Pecans are my absolute favorite, so this cake is completely calling my name. YUM. This is a must-make! What a beautiful holiday cake. I love that you did a pecan pie cake! This is one amazing cake! And if I lived near you, I’d happily take the leftovers. 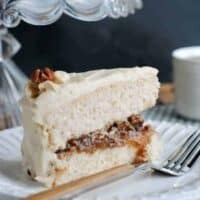 I’m always trying to give out extra goodies to friends when we have too much… No one’s ever refused when I asked:) What a gorgeous cake with that pecan pie filling inside! My grandma used to have a recipe for homemade spice cake, but I’m not sure what happened to it… Thank you for sharing the recipe, Aimee! You mean I can have pie and cake in the same sitting?! Where do I sign up?? I am dying to try a pecan pie filling, there are so many recipes I don’t know where to start. Such a fantastic cake! And that center … OMG, get in my belly! The filling between the layers – OMG! I could eat it with a spoon! This cake is gorgeous, Aimee!! I know my family would love it! Pinned! to answer your question: yes….yes I AM drooling!!! That brown sugar frosting and pecan pie filling are completely killing me right now! This is incredible! My family would really love it. Okay, I want this cake for Thanksgiving! I mean it has the word “pie” in it, so I think all my bases are covered! I am seriously obsessing over that gooey pecan filling! I love that you offer leftovers to your neighbors!!!! You must be well loved!! This cake is such a stunner, Aimee! I can’t wait to give it a try! This is so beautiful Aimee!! Perfect for the holidays! My husband’s a big fan of pecan pie. I made this for his birthday yesterday and he loved it. Make sure you cutoff the dome on the cake bottom. That’s key to the filling remaining in place. HI! Any chance I could just use a white cake box and add the spices to it? I made this cake today for my wife’s birthday and I have to say–we all loved it but I found it too sweet to have more than a few bites. I followed the recipe for the filling and frosting (I did use box cake to save myself time) are there any recommendations you’d have for adjustments that might cut the sweet a little without losing flavor? I suppose you could top it with a whipped cream frosting, to make it a little lighter!? See Below, I think it would be wonderful with this cake. Combine cream cheese, sugar and vanilla. That sounds delicious Elizabeth. Thank you for sharing! So I just made this cake and it is DELICIOUS! My only issue was the filling was so incredibly thick, but kind of runny at the same time. It kept oozing out the the sides of the cake and completely ruined the frosting on the bottom layer 🙁 Any idea what I did wrong?? It is a “runny” filling. I refrigerate mine before serving and that helps keep it more firm! I don’t have a cake leveler…I don’t even know what that is! What I DO have is a Wiltern layer cake slicer. (a piece of piano wire attached to metal rods. It works wonders. 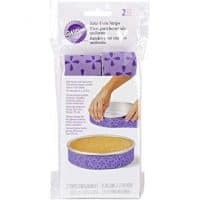 I use it for when I am making a layer cake or need to make a cake level. It came out AMAZINGLY. I refridgerated the cake for 30 mins AFTER putting the filling on, and BEFORE icing, so it wouldn’t ooze out and ruin the look of the cake when applying the frosting…and it worked! I just drooled on my keyboard! It was soooooo good! Thank you! ok it looks good, but does it taste good.? Could you make this into a bundt cake? You’re basically my cake hero! HOLY COW this idea is beyond awesome and I love all the flavors here in the pecan pie filling in between the layers! Thanks for the rockin’ recipe! This is one of the most delicious cakes – and a perfect twist for Thanksgiving! I’m definitely drooling looking at the pictures! 🙂 The pecan pie filling sounds fantastic and I’ve been thinking about making a cake this year for Thanksgiving as an alternative to pumpkin pie. Think I found the recipe. Thank you so much! Love this cake ! Can’t wait to try this gorgeous cake! 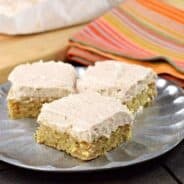 Super delicious and easy to make. Winner with the family! This MUST happen for Thanksgiving! I have to make this for Thanksgiving! The pecan pie filling is drool worthy! This looks like such a show stopper! This needs to be on my holiday dessert table as the centerpiece! 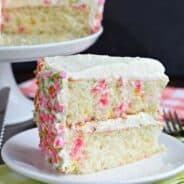 Can you use regular flour in recipes that call for cake flour or am I asking for trouble by doing so?